Aleph Farms are one of the world leaders in cell agriculture and are currently developing bovine meat with a 3D meat texture. 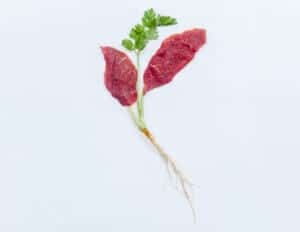 Based in Israel, Aleph Farms declare that they are “shaping the future of food by producing clean meat that resembles free range meat”. CEO of Aleph Farms, Didier Toubia, was previously co-founder and CEO of IceCure, which went public in 2010. He trained as a Food Engineer and Biologist at AgroSup in Dijon, France, and holds a joint Executive MBA degree from the Kellogg and Recanati business schools. Here Didier answered questions about their process and development, exclusively for vegconomist. What differentiates your products from other clean meat manufacturers? Gold standard today is not to produce clean meat, but rather clean animal proteins. Meat is a complex muscle tissue composed of different cell types arranged in a 3D structure, not just a mass of cells. Here comes Aleph’s unique 3D technology, based on a tissue engineering platform developed at the Technion – Israel Institute of Technology for regenerative medicine applications. Will you focus on beef/cow meat only? Firstly, we believe beef is the application which makes the most sense for clean meat, due to the environmental impact – greenhouse gas emission, land occupation, etc. – of cattle and inefficiency to produce beef protein with conventional methods, in comparison to other animals (9g of plant protein in feed to produce 1g of beef protein, versus 1.1 to 1.4g of protein from feed to produce 1g of fish or chicken protein). Second, most of the experience in the world with tissue engineering is with mammals, so starting with beef makes sense in terms of technology transfer. Third, the selling price of beef is up to three times higher than poultry or pork, depending on the countries, making beef the only way to become profitable on the short term, given the high initial production costs of clean meat. Cost will go down with economies of scale. Cells Sampling & 3D Tissue Formation – what do these terms mean to the layman? Aleph’s unique platform enables us today to grow different types of cells in 3D dimensions using a scaffold. Aleph’s vision is to grow a steak in an efficient and scalable way – we’ll get there in steps. That is important because for clean meat to become over time a real alternative to conventional meat, we believe the clean meat industry should offer real meat, not just ingredients for hamburgers or meat balls. That is what the consumers expect from us as an industry. Your end goal is to disrupt the meat industry; who is your target market and what will motivate them to eat this product? We believe the two key challenges for clean meat are: 1) offer the right products, 2) scale-up and cost. The later challenge has been thoroughly discussed already. We don’t talk enough about the need for the product to be appealing. Aleph is targeting meat-eaters, and maybe more specifically flexitarians: meat-eaters sensitive to the issues associated with conventional animal farming. When the consumer makes a purchasing decision in the grocery store or supermarket, he decides upon his preferences here and now. The vision of the company behind the product is not a key factor here, except for niche markets. Thus, when it come to go-to-market, actual product benefits are the key. Clean meat is grown with no antibiotics, while over half the cattle in the US is still grown with antibiotics. In addition, the clean production method allows for ensuring no contaminants grew in the end-product. Most of the pathogens contaminate the conventional meat at the slaughterhouse. Finally, a very important aspect of clean meat is traceability and transparency (can talk about horse meat in Europe, mad cow disease, etc). Consumers want to know where the meat comes from: clean meat is a way to rebuild trust in meat. When are your products ready to market? Our products will be ready for the market in 2021.